Finally, it's time for fun. After months of bouncing around ideas of what my building might look like, the day had come to review various designs that leveraged the space and light of the lot I purchased and the functionality I have defined. The design team and I agreed on some basics early on. First, that the ground floor would be a large masonry rectangle a little over nine feet tall, to serve as the basis of the garage/shop facility on the north end, garden walls in the middle and as the platform for the modular construction on the south end of the facility. It provides a strong, secure and low cost base for the entire project, with a virtual Lego set of possibilities on top. Pictured below you can see just a few of the ideas presented to me. 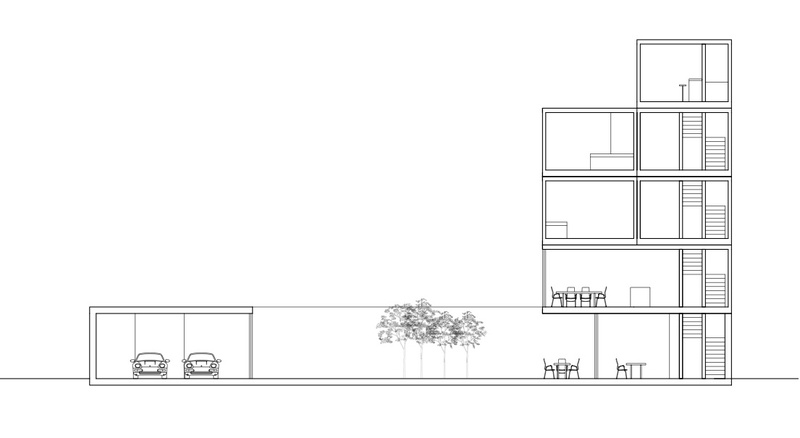 Design ONE is a three floor version where the living/office space is spread across both ends of the compound, requiring a breezeway of sorts to connect. It also creates a very cool 1950's "motor lodge"look, with terraces on both sides looking down into the court yard. On the positive side, it created private living on both ends, but it might 'seclude' my seven year old son, and seems to close in the outdoor space/courtyard. 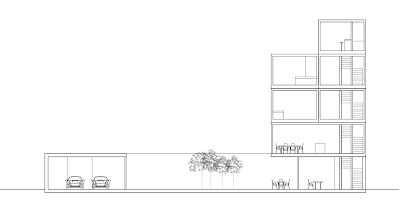 Design TWO is a four floor version that moves all of the living/office space to the south side, it is exactly the same layout and square feet but shifts two of the 'modules' to allow for a taller structure. The top floor, which will be used as an office/den should have a good view of the harbor and if I am really lucky the Statue of Liberty. In addition it provides expansion space over the garage/shop for a future apartment or additional office space. The thought behind this design is that with roll-up doors on both sides of the courtyard, it would create a great 100 feet long living space comprised of indoor and outdoor space. Very open and flowing. Design THREE is a five floor version that split the workshop/studio from the garages and shifted the galley, dinning/meeting, living area up to the second floor. 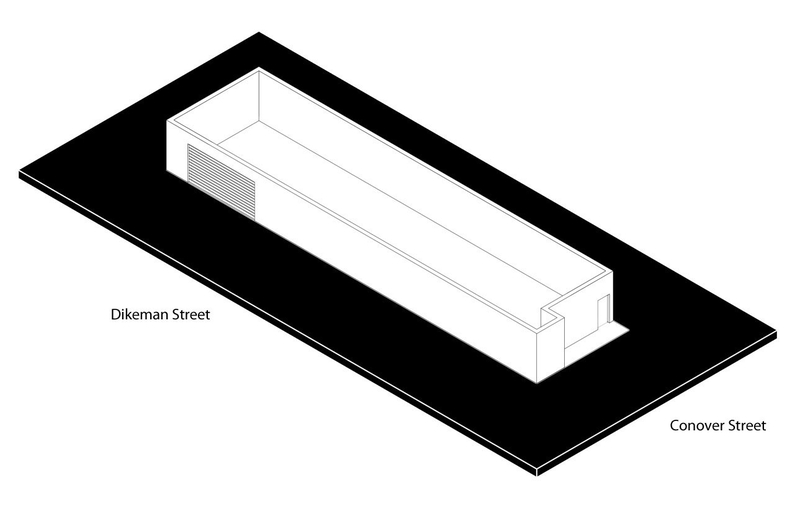 This layout while clearly raising the the office/den to a higher altitude and creating slightly more outdoor space, it did disrupt the concept of that floor through living experience, that I have really gotten to like. So which one of these do you prefer? Any one in particular? Or some combination of all? Love to hear what you have to say. Next time I will tell you about what I decided and show you a 3D rendering. Stay tuned for more details and drawings. For design option 1, would you feel a car pulling in under you? I like the idea of option 2 because you may be able to see the harbor and the statue of liberty. So with design 3 the outdoor space is the big bonus and the extra elevation would give you more views. I would vote for 3 on that alone. But the bonus of design 1 are the terraces. So I'm stuck between 1 and 3. What is the square footage of the garden on options 1, 2, and 3? Would love to see what the render will look like with the views of the garden from each floor. What kind of windows are you considering for the upper levels? Should not feel car in option one, it's on a concrete slab with steel beams. Terraces on all, just different. The terraces in one are facing inward, in 2 and three they would be created by the offsets of the boxes. All windows will be Aluminum with a special high Rvalue coating.